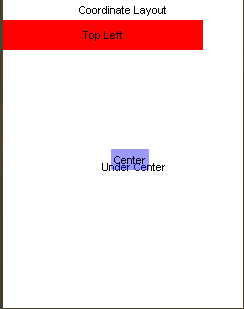 Chen & myself are huge advocates of placing everything within LWUIT using layout managers, maybe its due to our Swing background and maybe its just our bad experience with the unique ways in which phones break when placing things absolutely. A common request from users after LWUIT 1.0 was published was for a means of placing a component at an X/Y coordinate. We generally avoided that, since it doesn't make much sense. In that case why not just use Graphics, images etc. We did however see two minor use cases for coordinate layouts, the ability to place elements in elaborate structures and the ability to place components one on top of the other (z-ordering). Notice that z-ordering can be achieved with other layout managers (in theory) but its not currently supported by any other layout. Different font size for the title/soft button areas. Signal/battery status on the top of the screen is shown by some operator firmwares even in game canvas! So you would need to constantly check and recalculate coordinates in order to make sure that they are correct if you were to use an "absolute layout". Coordinate layout does that check for you and lays out the components in the proper positions based on your intentions. We create a coordinate layout in 200x200 rather than screen resolution, these are "virtual" coordinates and they would be adapted to actual coordinates when the layout occurs. We can now "assume" that our resolution will always be 200x200. BTW java.net is experiencing some issues this week with a DOS attack, read more about it in Terrences blog.